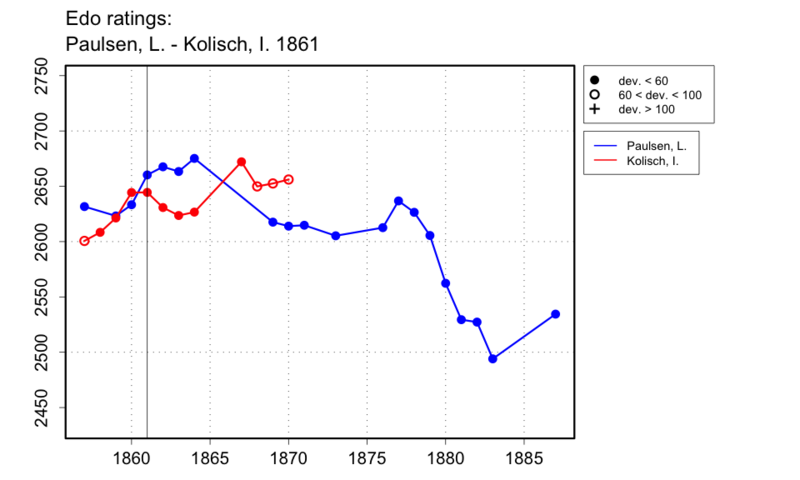 The obituary of Kolisch in the Chess Monthly (see Sarah's Journal website) and the Field of 19 June 1880 give +7-6=19 for Paulsen; the Richmond Daily Dispatch of 21 Dec. 1861 (see Sarah again) and the Illustrated London News of 16 Nov. 1861 give +7-6=15 (but this may not be the final result); the Sunday Times of 24 Nov. 1861 (p.5) gives +7-6=8; all other sources give +7-6=18. Shakhmatniy Listok of June 1862 (pp.124-125) gives a list of the 31 games with openings and result of each. The Richmond Daily Dispatch (see Sarah) gives end date 15 Nov. 1861, but the Era of 24 Nov. 1861 (p.14) makes it clear that the last game was played on 18 Nov. 1861. The Illustrated London News of 5 Oct. 1861 says the match started 'on Monday last' (so presumably 30 Sept. 1861); this date is also given by the Oct. 1861 issue of the Chess Player's Chronicle. Spinrad gives the result +1-0=2 for Paulsen in offhand games against Kolisch (from Life Maps of the Masters), and the Illustrated London News of 21 Sept. 1861 (p.309) gives this result from 'a short encounter' between Paulsen and Kolisch, but these were almost certainly the 3 games between them from the Bristol tournament.